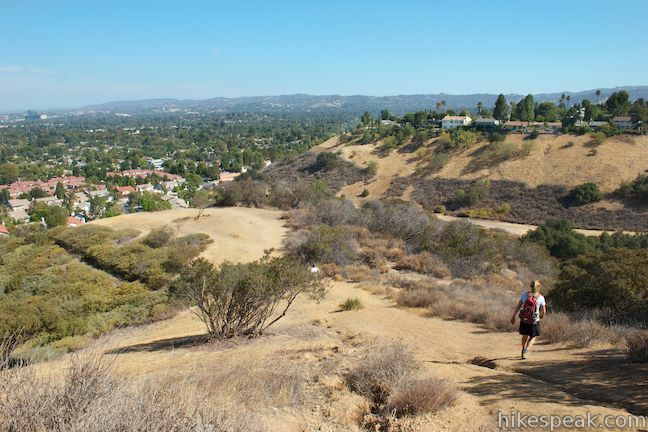 Are you looking for a hike that’s an action-packed adventure? 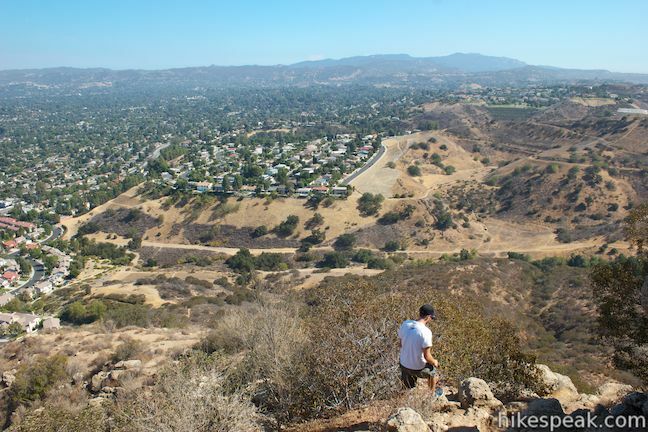 Rarely does a 2.1-mile loop offer as much excitement as the hike to the Cave of Munits and Castle Peak. 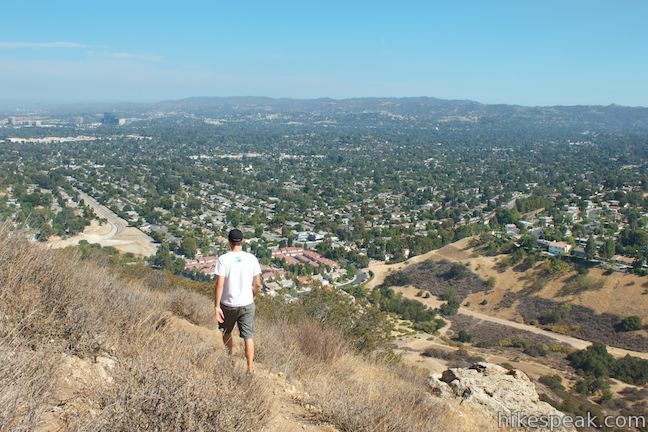 You’ll start with a gradual warm-up across El Escorpion Park to Upper Las Virgenes Open Space Preserve to find a fun vertical cave just begging to be explored. 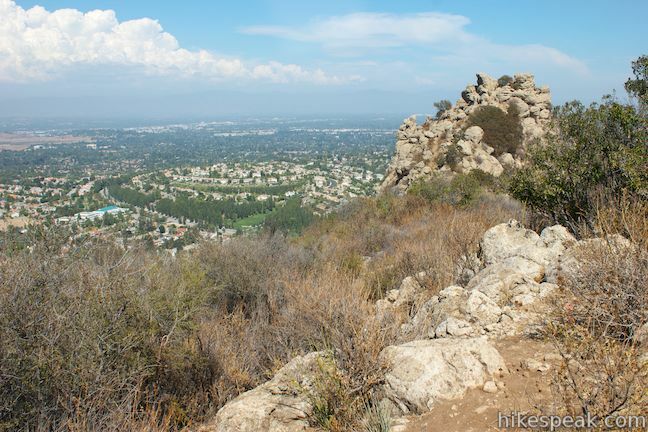 You won’t need any ropes or gear to get through the cave, just an adventurous spirit that will lead you out the top of the cave to a tough off-trail ascent to Castle Peak, a panoramic summit towering over the west end of the San Fernando Valley. 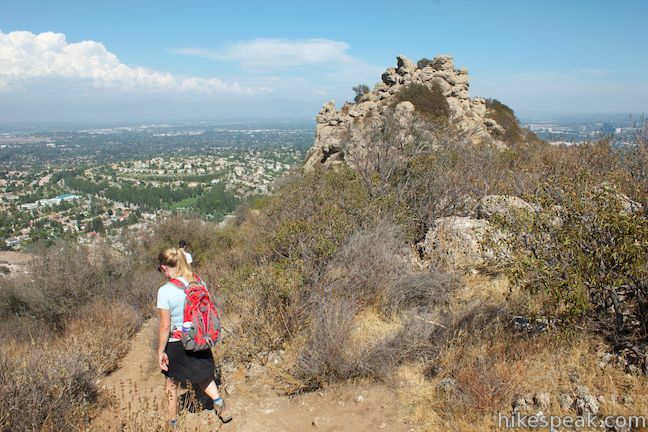 The loop closes with a swift descent from the crown of jumbled rocks. Are you up for it? 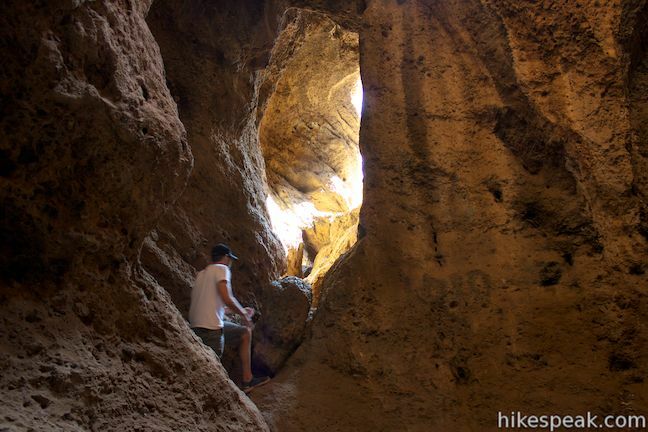 To visit another nearby cave, check out Vanalden Cave. 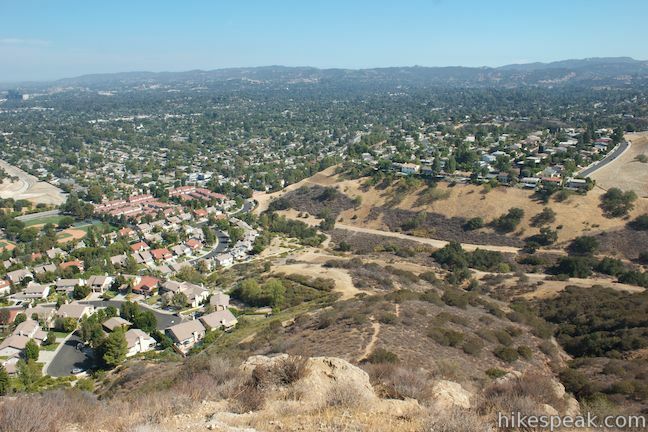 This hike begins in West Hills where the west end of the San Fernando Valley meets the Simi Hills. 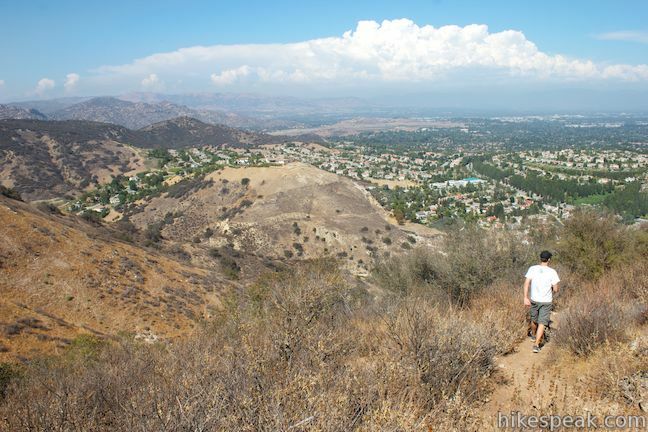 The loop has 725 feet of elevation change, but only 250 feet are gained in the first 0.8 miles leading to the cave. 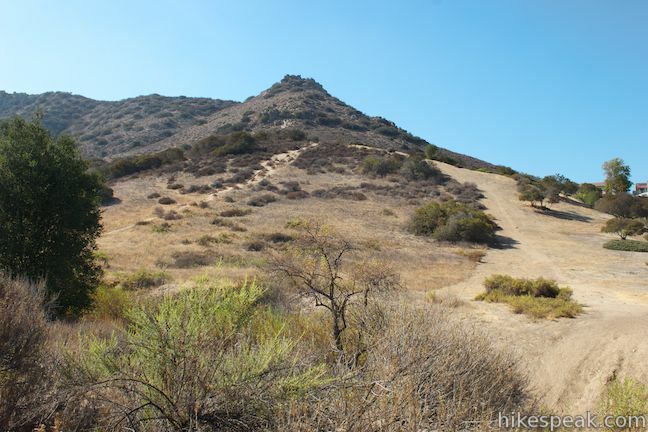 Most of the elevation comes on the steep ascent to Castle Peak. 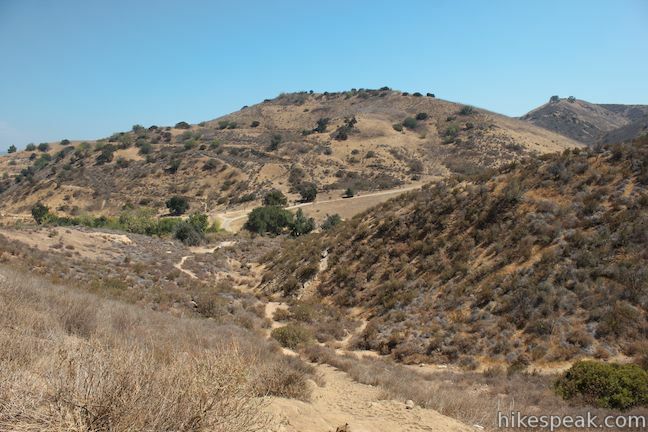 The start of the hike crosses between El Escorpion Park and Upper Las Virgenes Canyon Opens Space Preserve, passing between Los Angeles County and Ventura County at the same time. 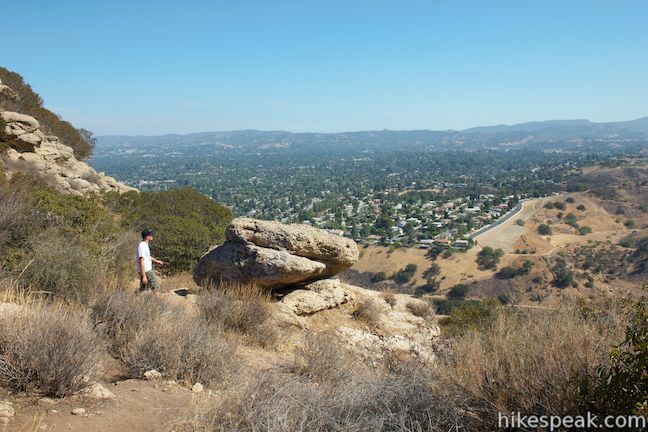 This fun hike reaches two attractions in two parks in two counties all in just over two miles. Sounds too good to be true, right? 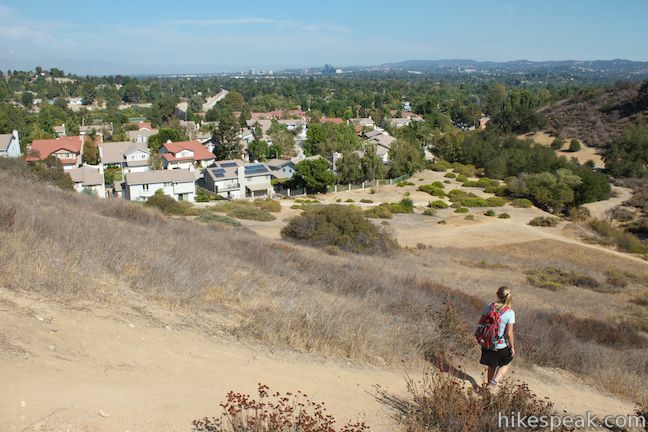 Start hiking up El Escorpion Trail, a wide dirt trail parting from a bend at the end of Vanowen Street in West Hills on the western edge of the San Fernando Valley. 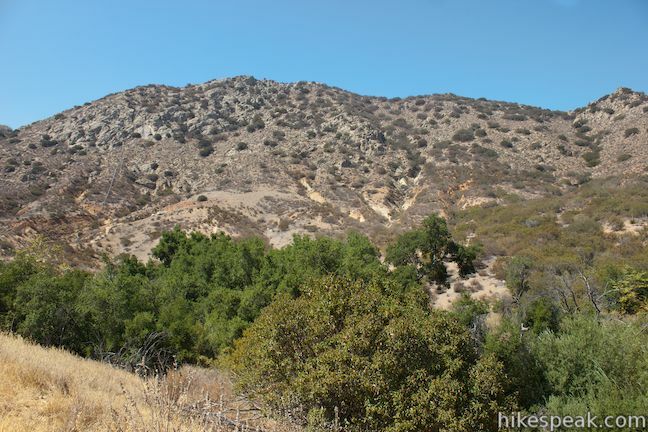 El Escorpion Trail (labeled Moore Canyon Road on Google maps) whets peak-baggers’ appetites at the start with head-on views of Castle Peak, before curving left to proceed west into the canyon below Castle Peak. Shade is scarce along the way, but a few oak trees provide brief cover from the sun. Stay straight past several paths breaking off to the right (one of which will be your return route down from Castle Peak). 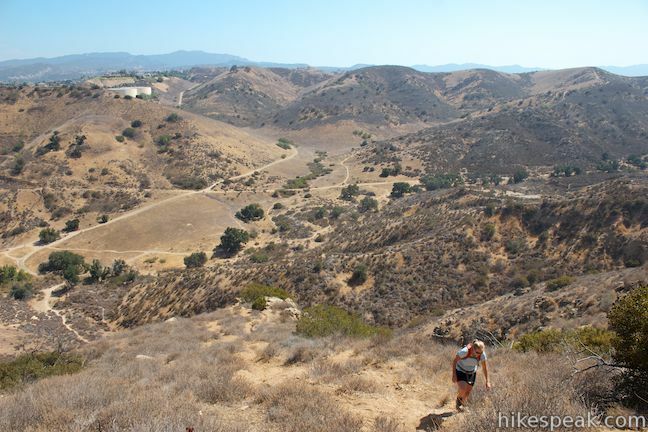 After heading ever so gradually uphill for 0.4 miles, pass a collection of logs on the right that looks like a circular fort and begin hiking up a rise in the trail. 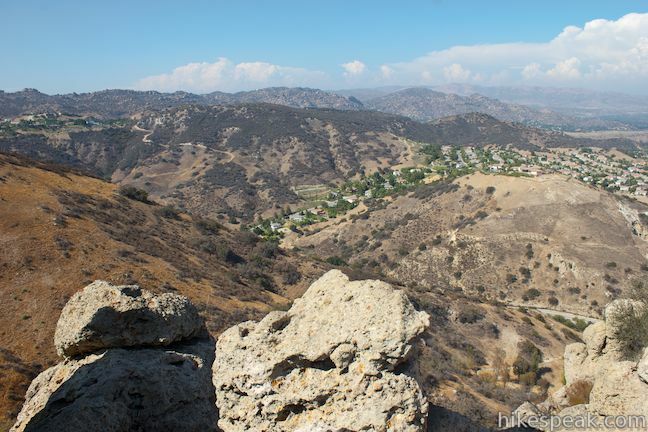 On the other side of the crest, reach a fence marking the boundary of Upper Las Virgenes Canyon Open Space Preserve. 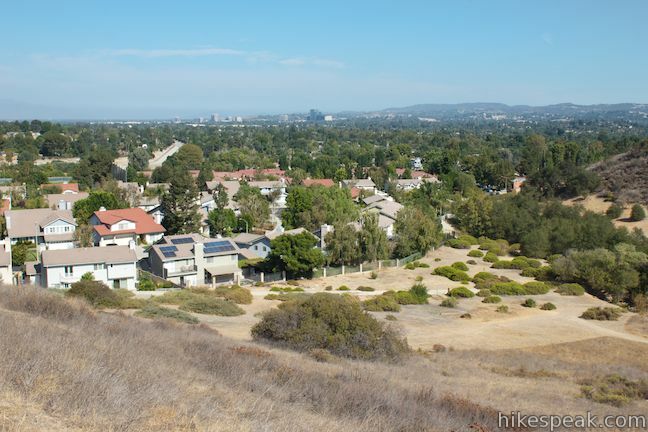 Cross through the fence, 0.6 miles from the start, leaving Los Angeles County for Ventura County. The trail splits on the other side of the fence. 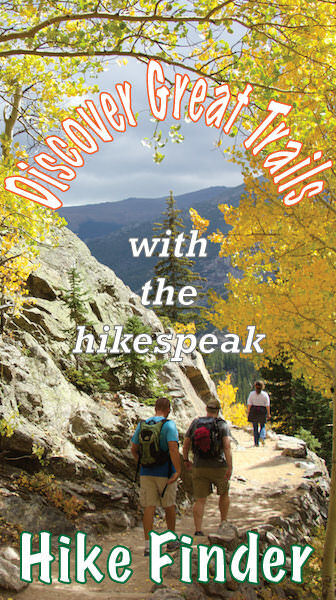 Take the right fork, angling toward the rocky mountain on the north side of the canyon. 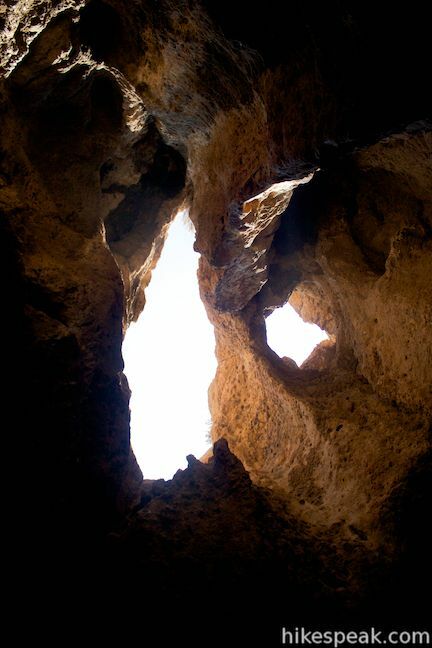 The Cave of Munits appears ahead of you and is taller than it is wide, looking like a squinting eye turned on its side. 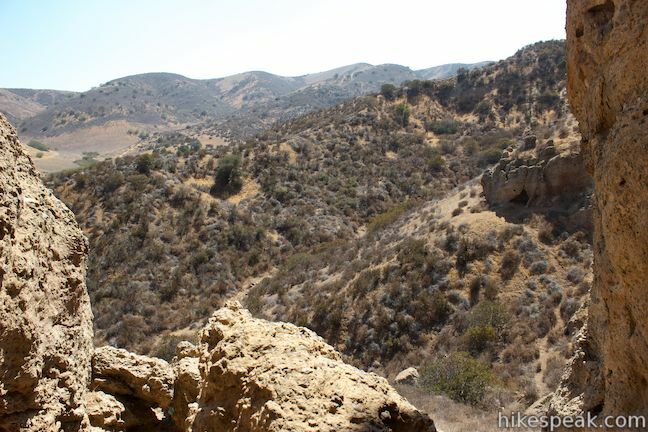 Proceed across the bottom of the canyon and up a draw in the mountainside. 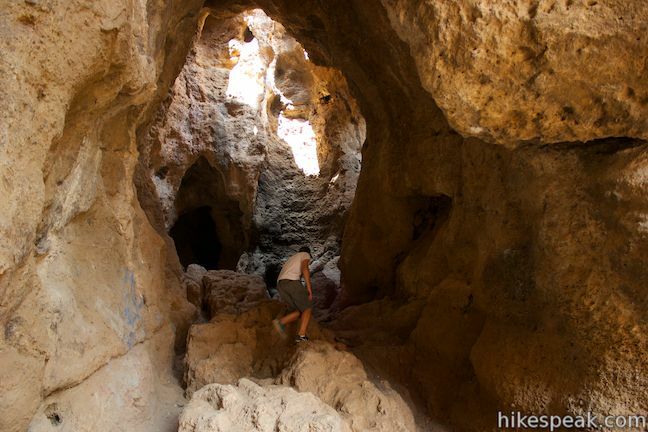 The trail leads right to the entrance of the Cave of Munits, 0.8 miles from the trailhead. 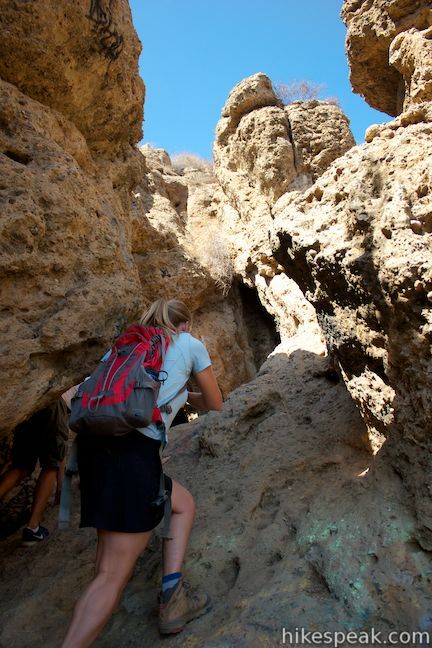 Getting inside the cave requires a bit of effort, but able-bodied hikers should not have a problem. 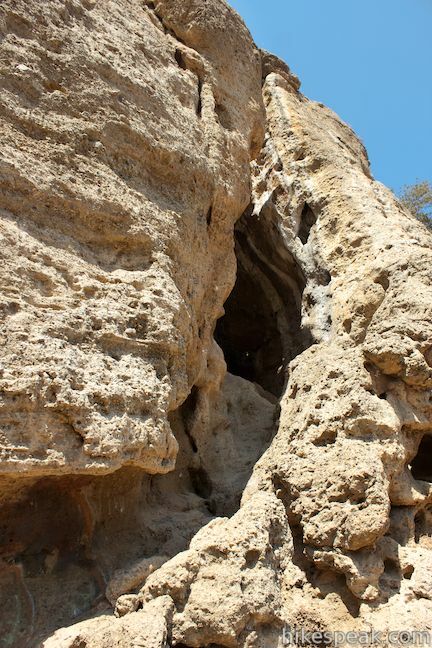 You won’t need any ropes or harnesses to explore the Cave of Munits, but you might see some mountain climbers scaling the vertical walls inside. To enter the Cave of Munits, find what looks like a ramp below the left side of the cave and amble your way up the knobby incline. 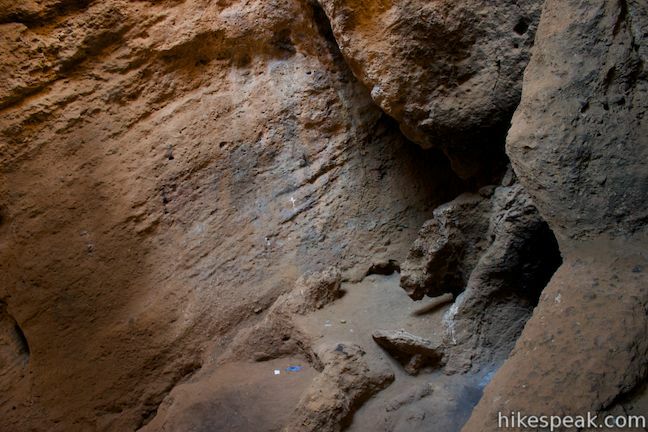 The cave is framed by a sedimentary composite that has good rocks and holes to grab on to. 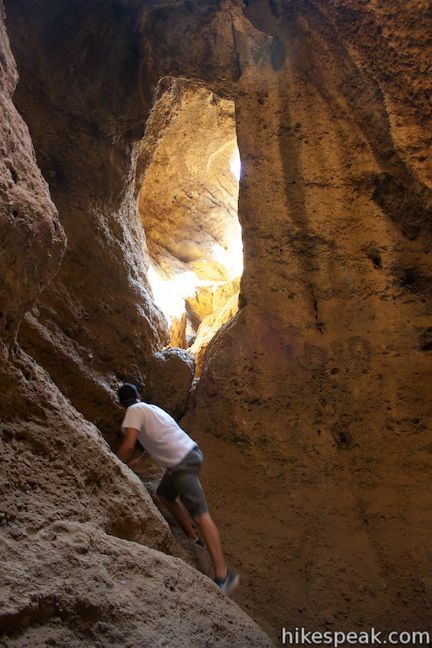 Hoist yourself up into the cave and begin exploring. 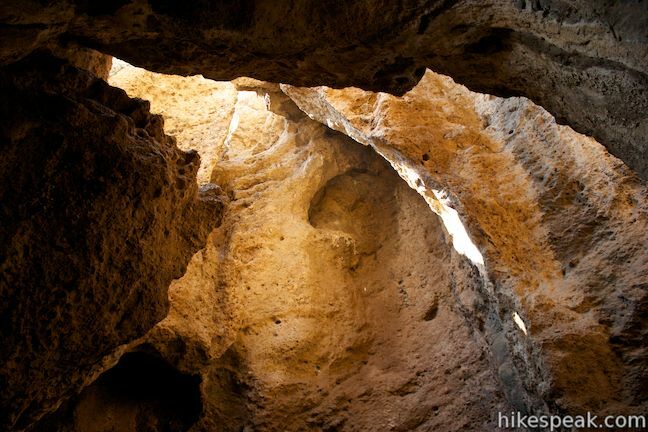 The Cave of Munits is only about fifteen feet wide, coming together above you in an impressive cathedral ceiling. 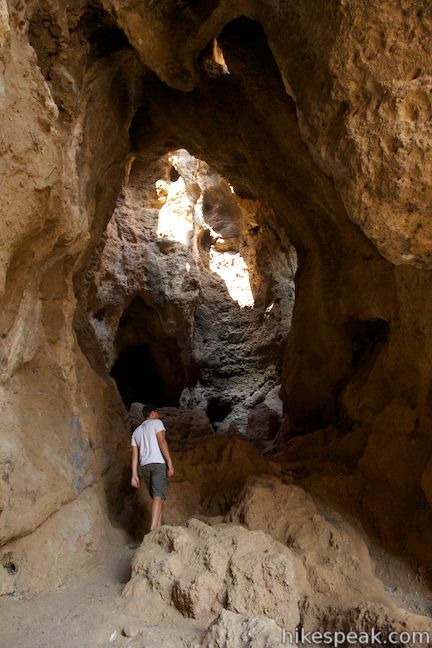 Before going inside the cave, look back out the entrance over the surrounding terrain. 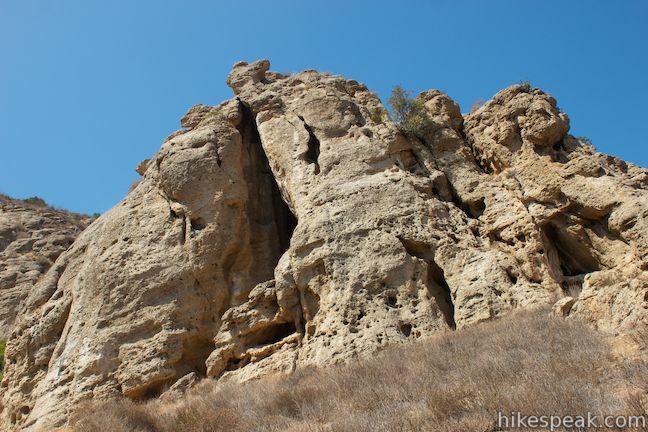 To the right, you’ll see a rock formation that looks like a castle buttressed by a frowning face. 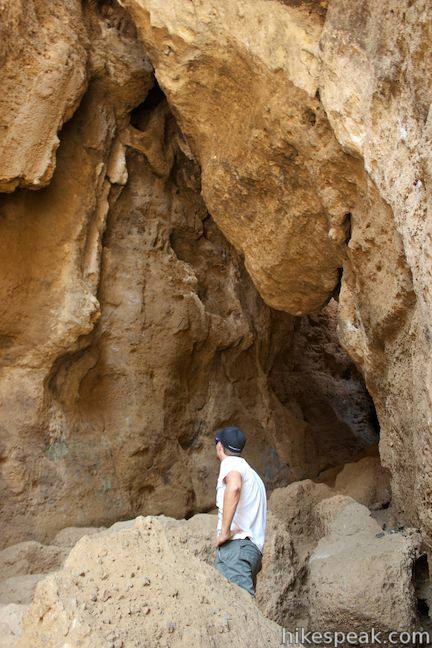 Venture toward the back of the cave by climbing over a few dusty boulders. The tall entrance way and a few skylights overhead provide so much sunlight that you won’t need a flashlight to see. 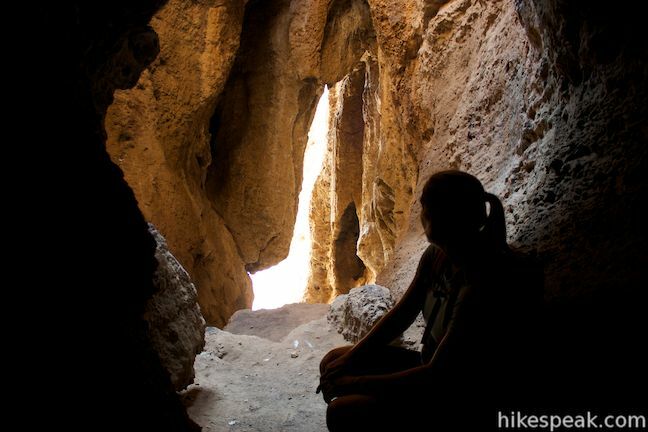 At the back of the cave is one dark chamber that gets missed by most of the sunlight, so you might want a flashlight to poke around in there, but otherwise the natural light is sufficient. 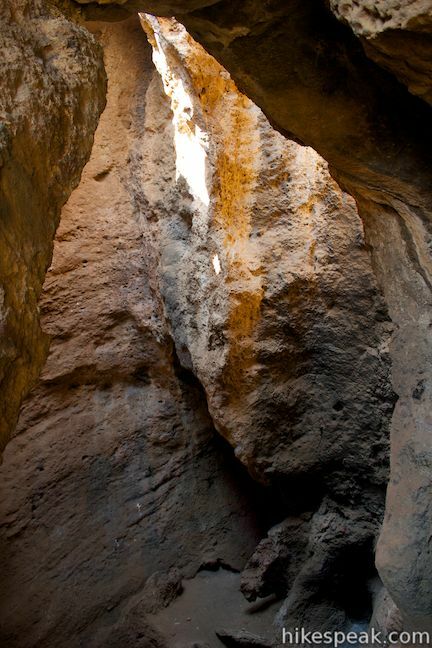 In the main chamber of the cave, the ample overhead light casts warm hues over the orange rock walls, making the Cave of Munits an inviting place to just hang out. 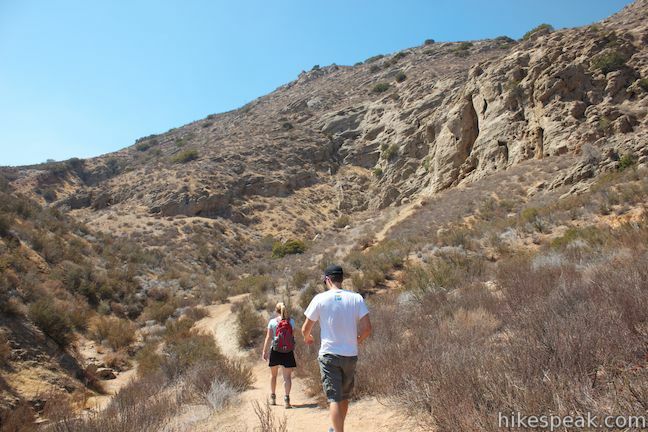 If you are satisfied after exploring the cave, you have the option to return the way you came for a 1.9-mile round trip hike with around 250 feet of elevation gain. 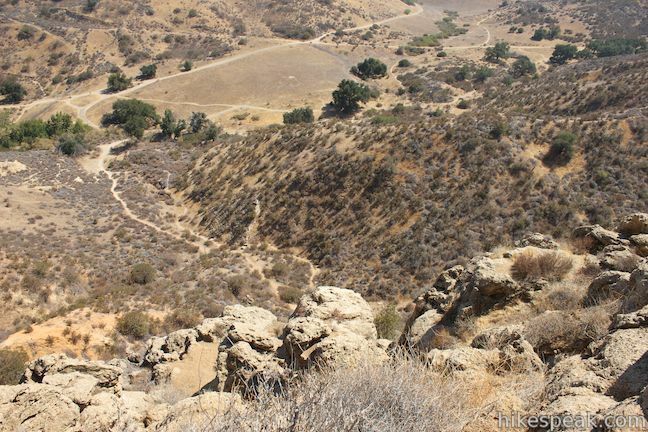 This fulfilling out-and-back hike is not very challenging aside from pulling yourself up into the cave. 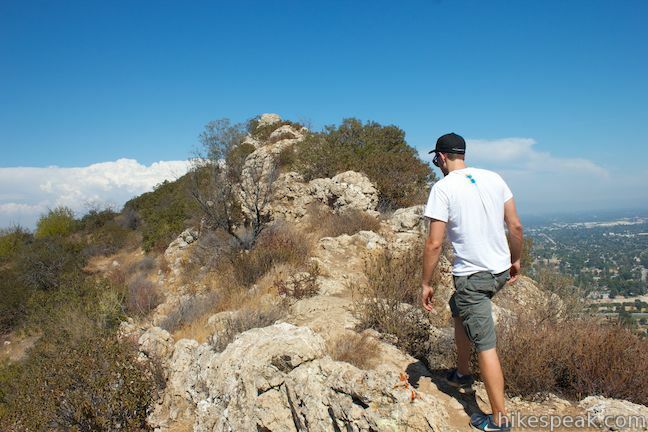 If you continue, you are in for a steep ascent to Castle Peak, rewarded by panoramic views. Stand at the back of the cave and look out toward the entrance you came in. 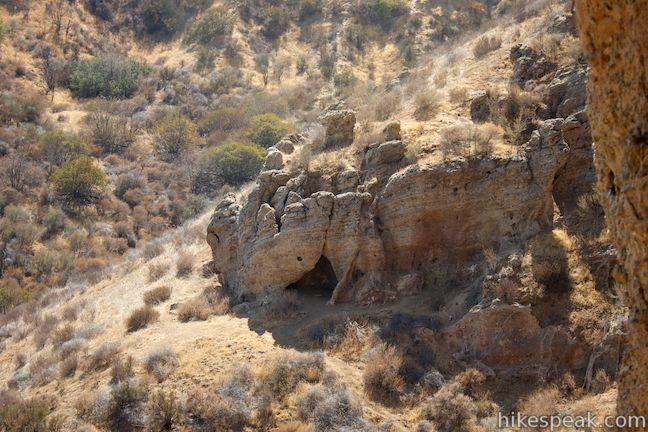 Notice a window on the left side of the cave about 25 feet off the floor. 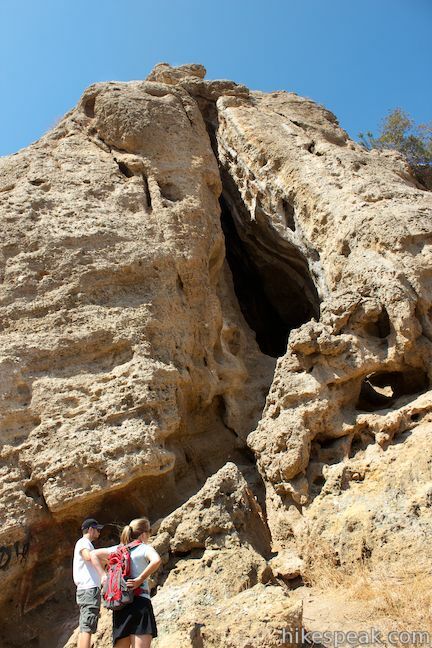 This is the second way out of the Cave of Munits, with access to the mountain above. 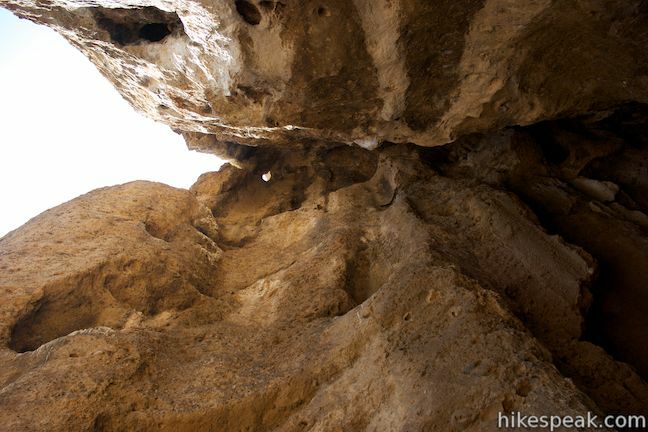 Climb up boulders to the window, which leads to a sunny natural balcony on the side of the cave. Enjoy views back over the canyon to the south as you wonder “where do I go next?” Turn around and spot the only viable way to proceed, a route across the roof of the cave. 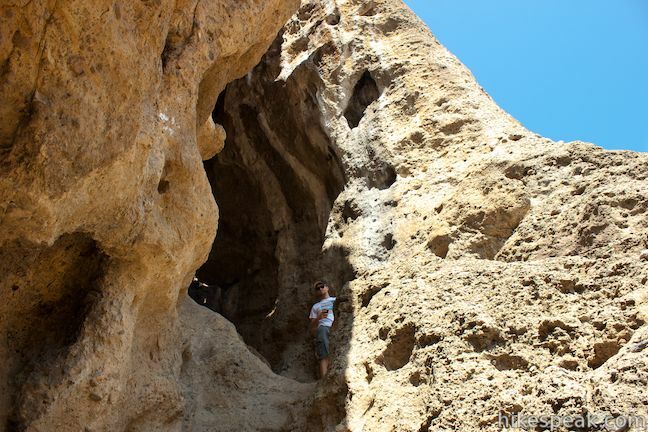 The not-for-those-afraid-of-heights route runs alongside a pair of the skylights that you were just looking up at from the cave below. 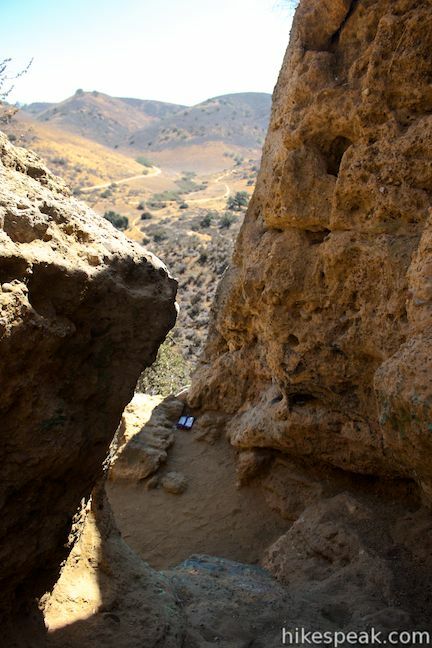 Carefully make your way up this rock walkway, only peering into the openings if you’re feeling bold. 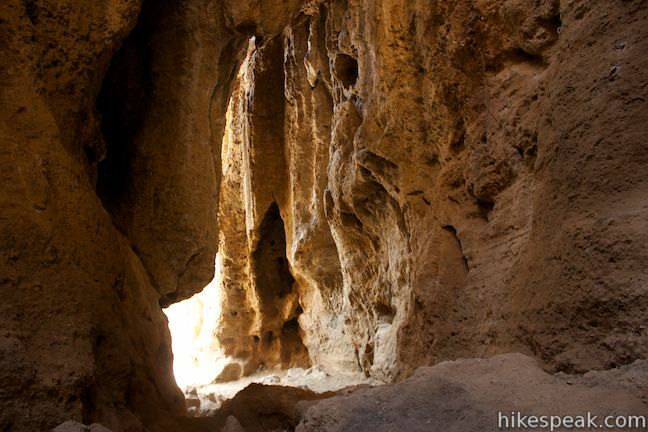 The route out of the Cave of Munits offers a unique and exciting experience. 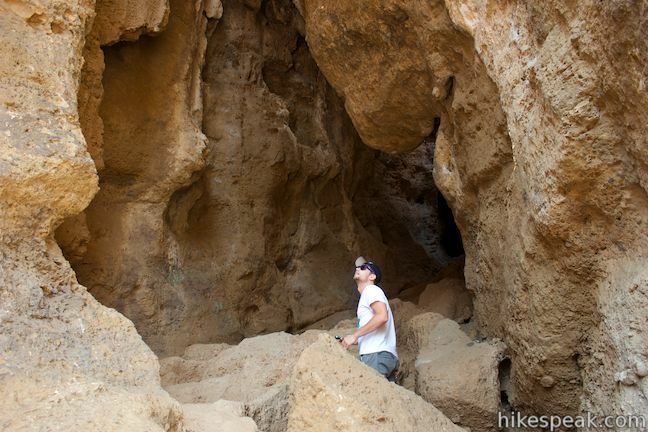 Climb above the boulders atop the cave and find a dirt paths going straight up the steep mountainside. 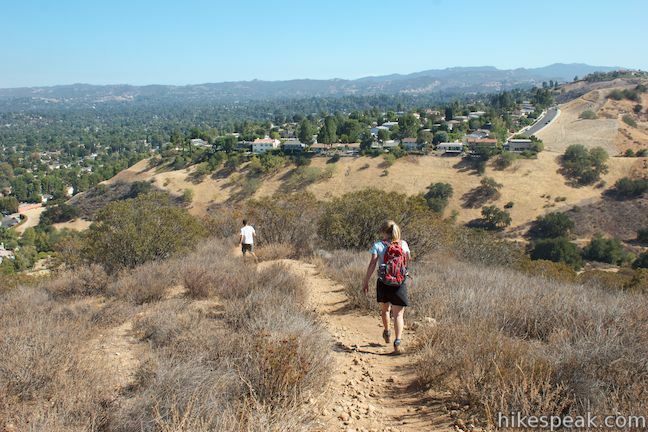 Gain about 450 feet in the next 0.2 miles on an arduous off-trail ascent. 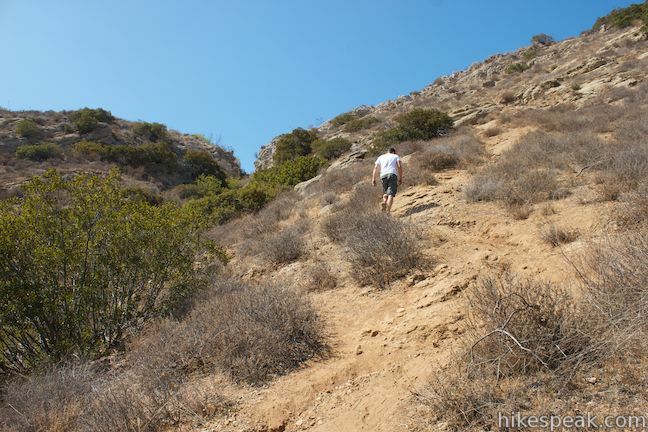 Make your way up the slope of loose dirt and boulders, aiming toward a gap in the ridge high above. 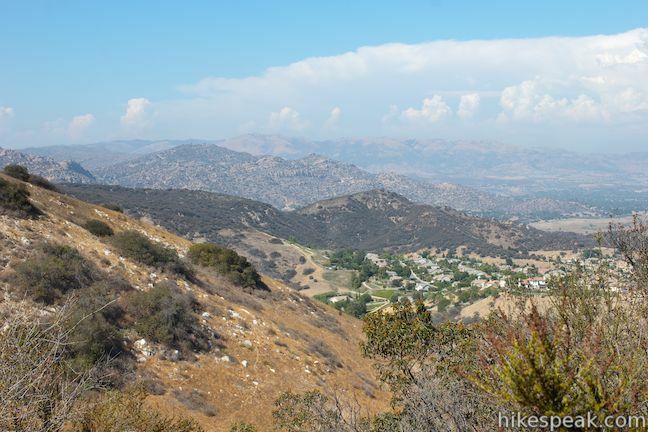 Any time you need to catch your breath, look back to the south over Upper Las Virgenes Canyon Open Space Preserve toward the Santa Monica Mountains. 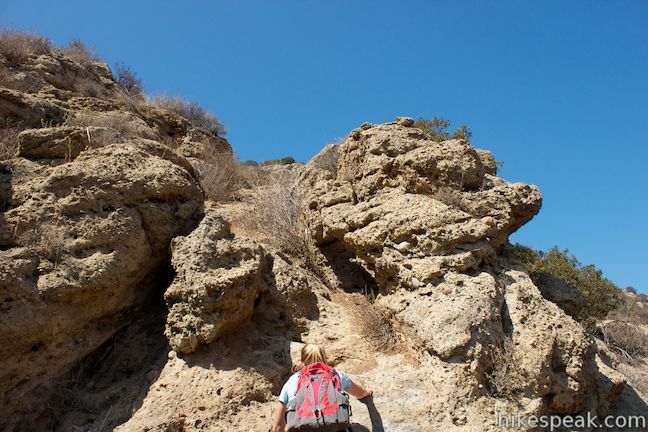 The paths up the mountainside come together to form one worn trail, which stays to the right of the gap in the ridgeline, eventually ascending to the top the ridge itself.The ridgeline is punctuated by a line of gnarly rocks resembling the back of a stegosaurus, making it an interesting place to hike. 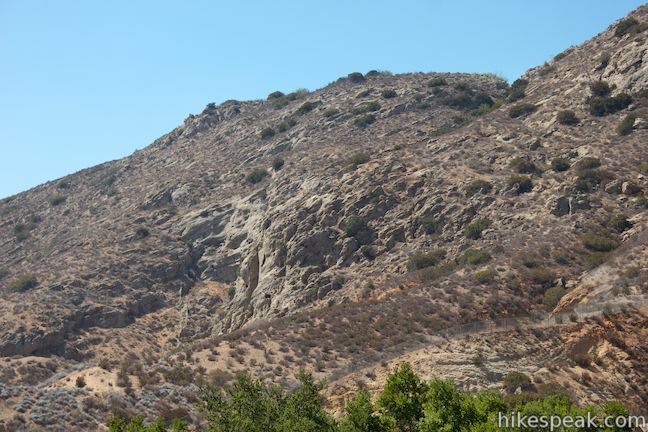 Castle Peak is located on the east end of the mountain housing the Cave of Munits and is not the actual high point of the mountain. 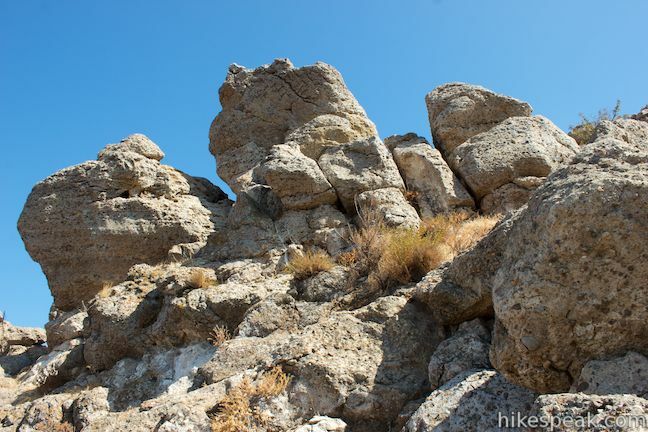 The actual summit is located on the rocky ridge stretching west from Castle Peak (almost directly above the Cave of Munits). 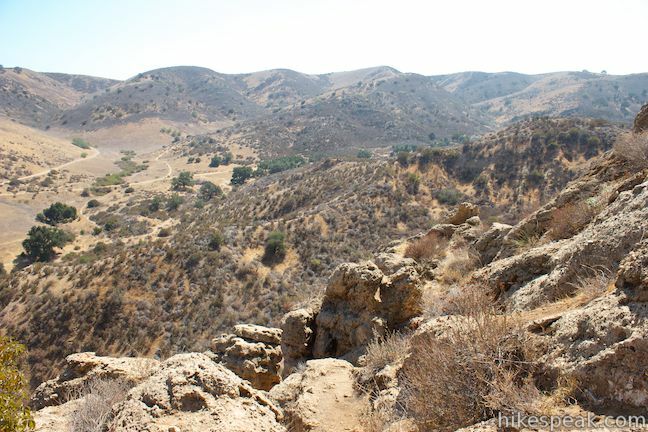 Turn right when you reach the spine of the ridge and hike less than a tenth of a mile to the summit. 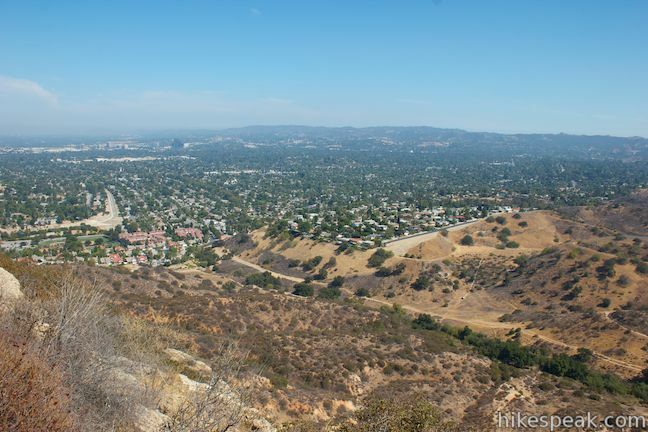 From the 1,639-foot high spot on the ridge, you’ll have views west over Simi Hills, south toward the Santa Monica Mountains, north toward the Santa Susana Mountains, and west across the San Fernando Valley (where the San Gabriel Mountains should be visible on clear days). 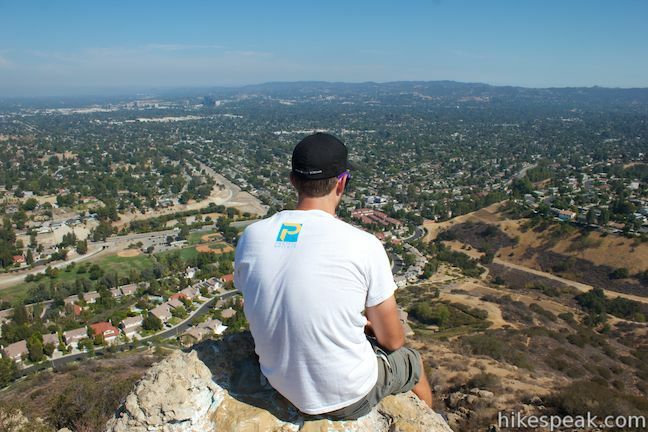 It’s a fine view, and you haven’t even reached Castle Peak yet! 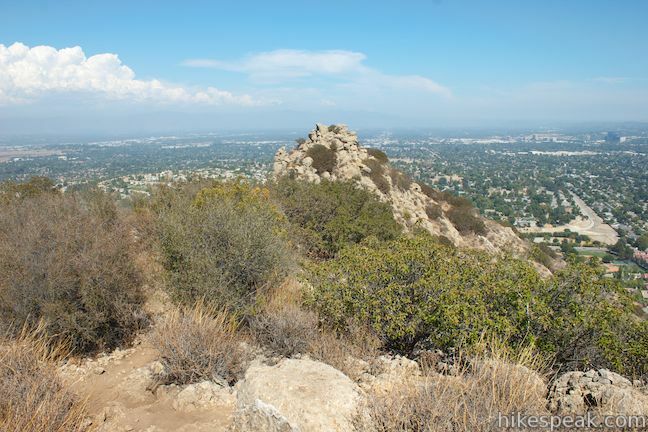 Continue a few hundred feet farther along the ridge path, climbing over boulders to a dip in the ridge. Turn left down a trail descending from the ridgeline toward another trail that is visible below, running parallel with the ridge. 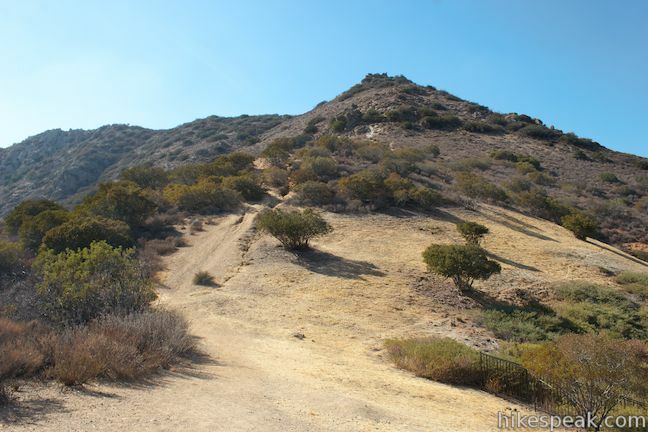 Hike 0.05 miles down this trail to a junction and turn right to reach Castle Peak. 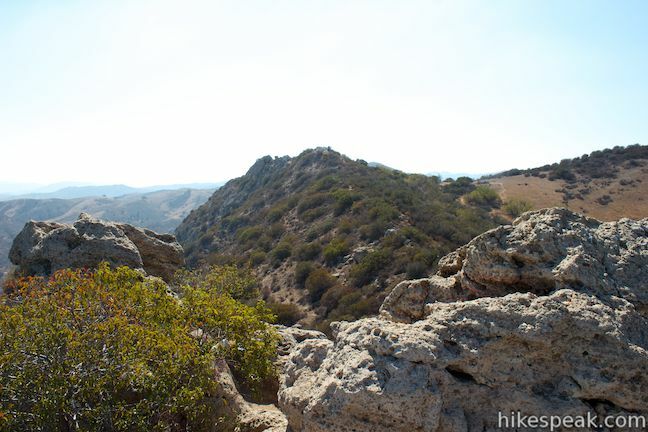 After 0.15 miles on a dirt trail through tall brush, come to a saddle just below Castle Peak (Escorpion Peak). 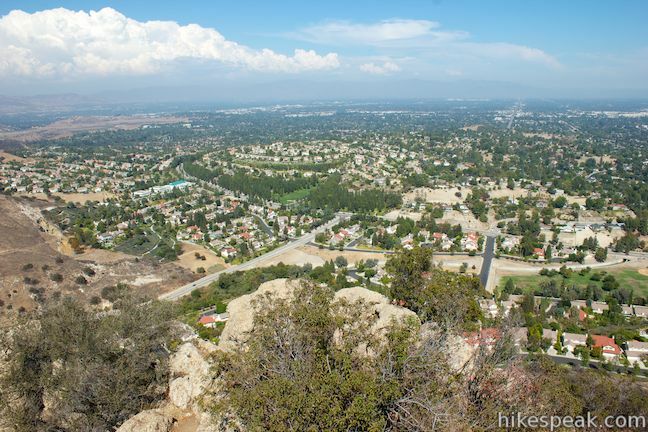 The rocky crown rises in front of you, framed by views northeast over the rugged and arid-looking Santa Susana Mountains and southeast across cities in the San Fernando Valley. Take a path continues up the left (north) side of the peak. The path fades once you get into the boulders. 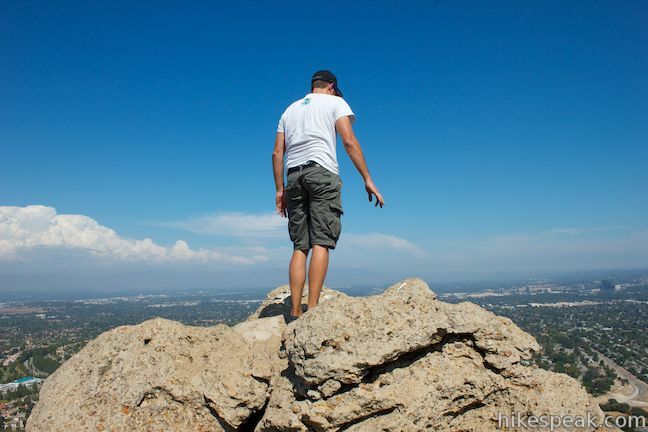 At that point, you’re on your own to scramble to the top. 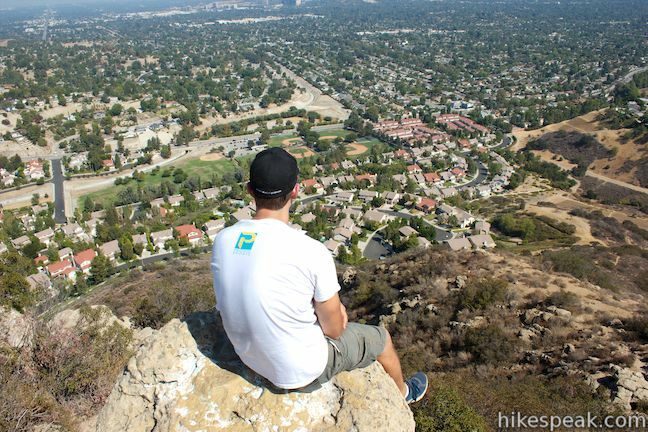 Take a seat on a rocky perch and enjoy big views over the San Fernando Valley, the kingdom of Castle Peak. 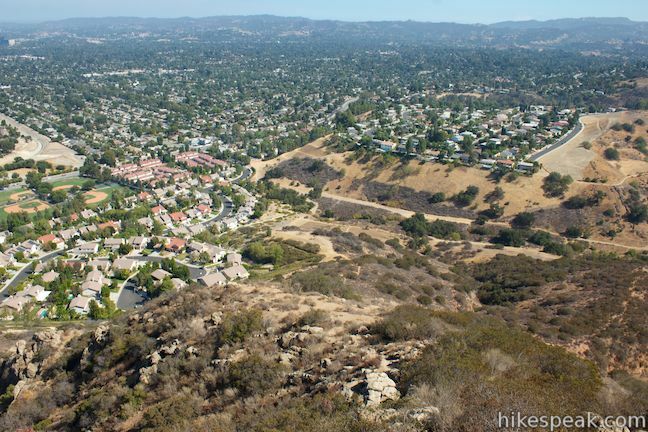 The steep mountainside below quickly reaches the edge of West Hills, and it seems like you are almost looking straight down on the houses below. 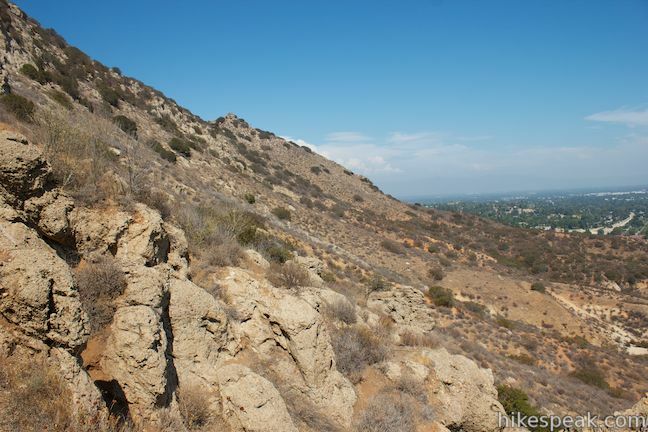 Spot El Escorpion Trail to the south and a path leading down the southeast side of Castle Peak to rejoin the trail near the trailhead. 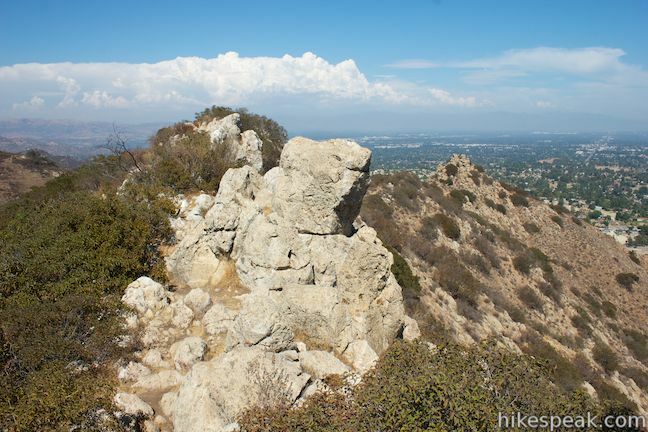 When you’re ready to leave the thrown, climb down the boulders on the southeast side of Castle Peak, finding a footpath down the mountainside. 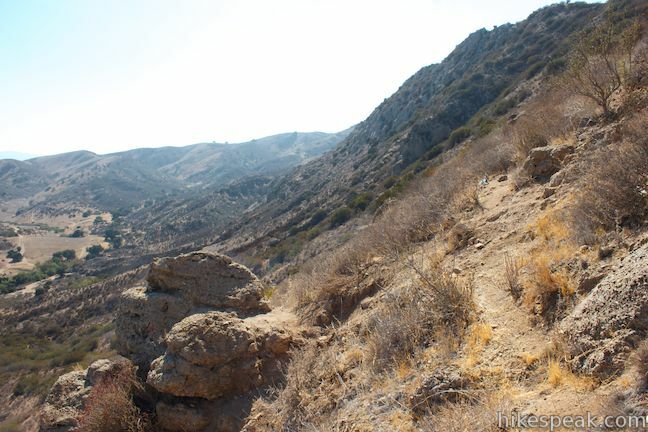 The slope is covered in loose dirt and boulders, and nearly free of large vegetation, allowing for a speedy descent. 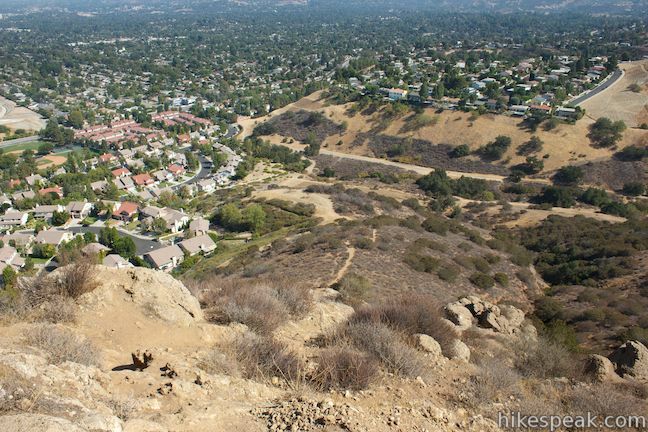 After 0.3 miles of descending, get to a landing where the trail widens. Descend another tenth of a mile to a T-junction and turn left, heading back toward the trailhead on level ground. 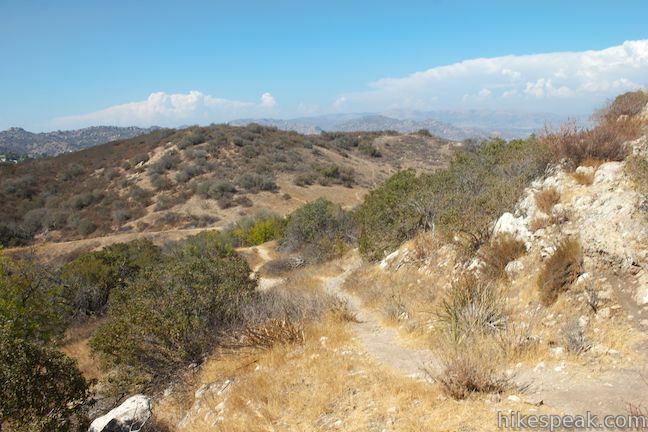 The trail curves to the right and crosses a creekbed to rejoin El Escorpion Trail, half-mile from Castle Peak. Turn left and hike the final tenth of a mile to the trailhead. 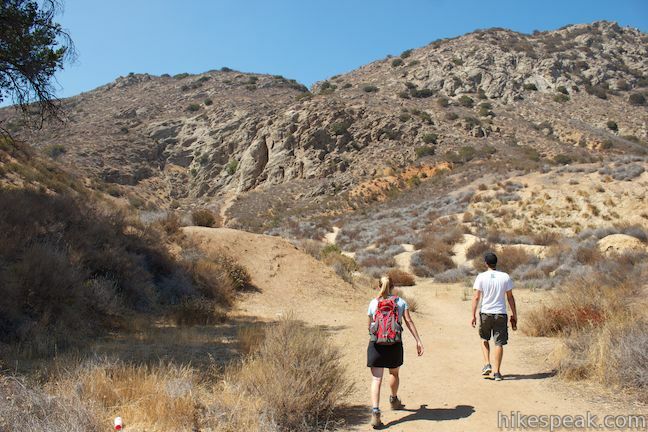 Because you will be trekking off trail for much of this hike, it is important to familiarize yourself with the area before you start. 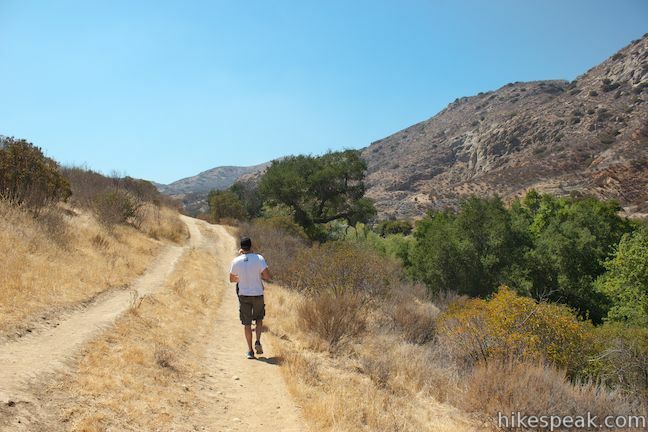 As always, your safety is your responsibility, so hike cautiously. 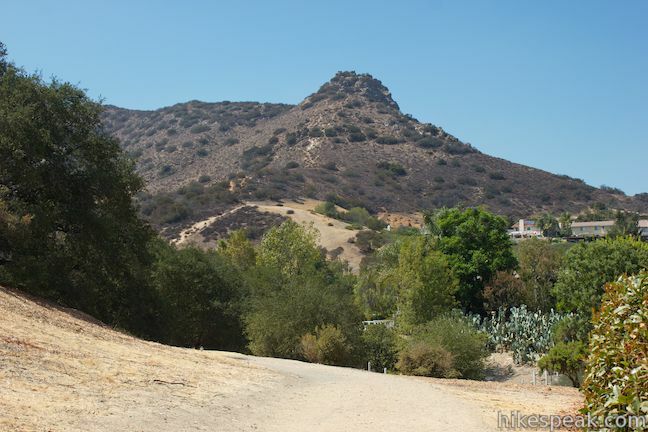 Dogs and mountain bikes are permitted on El Escorpion Trail, but mountain bikers will not be able to reach Castle Peak and dogs may have trouble too. 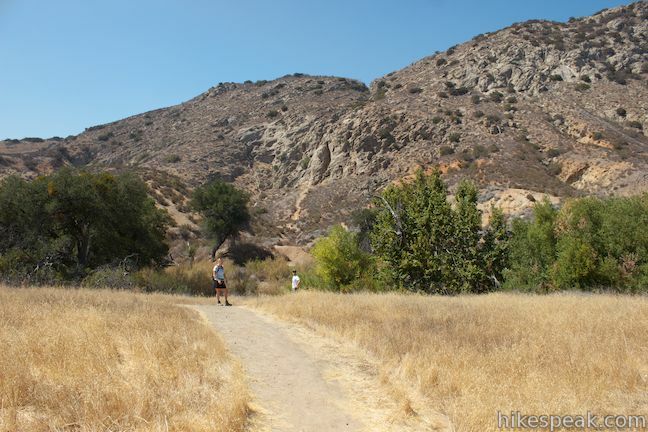 No fee or permit is required to hike in El Escorpion Park or Upper Las Virgenes Canyon Open Space Preserve, so get out and enjoy! 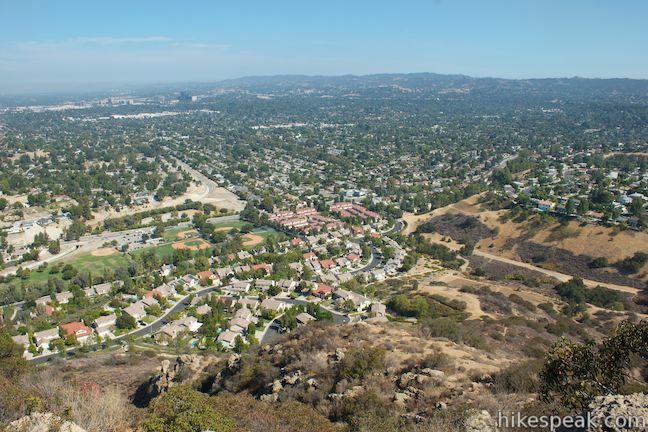 To get to the trailhead: Take the 101 Freeway to exit 29 for Valley Circle Boulevard. Drive north for 3 miles on Valley Circle Boulevard to Vanowen Street. Turn left and drive a tenth of a mile to a right-hand bend in Vanowen Street. 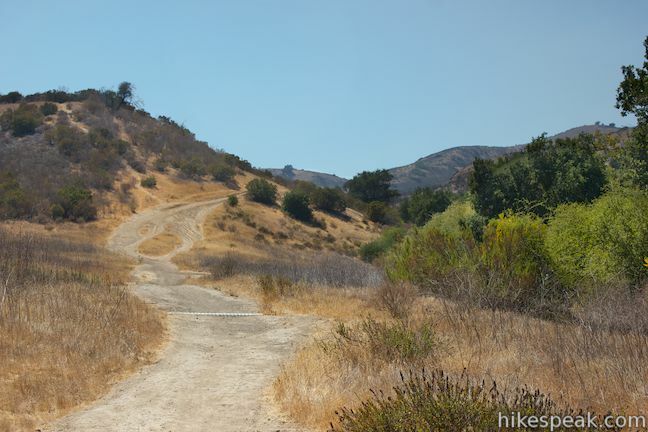 Park on the side of the road and find the trailhead on the left at the start of the curve. 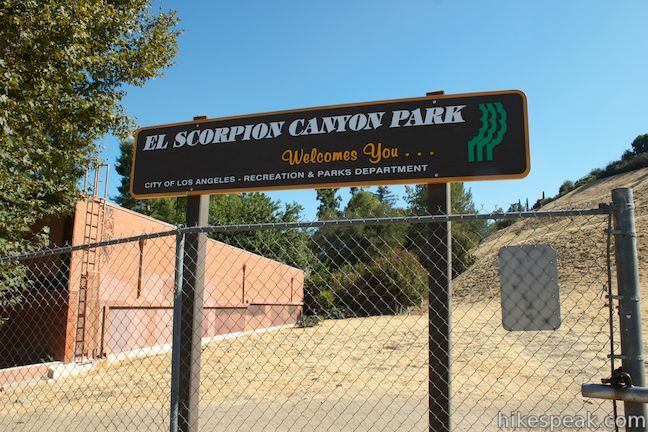 There is a Los Angeles City Parks sign labeled El Scorpion Canyon Park alongside the gated dirt road. 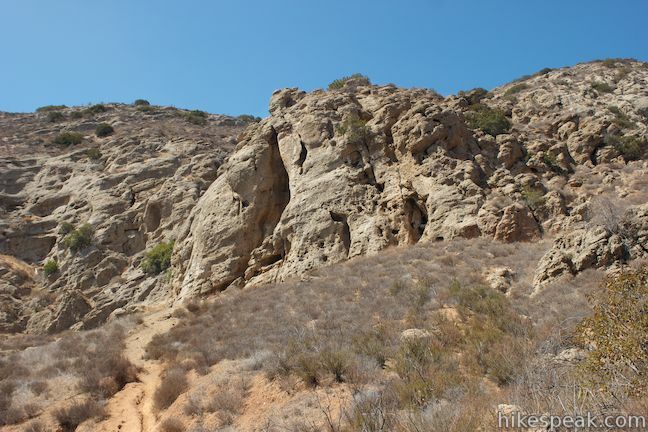 This 2.5-mile hike just off the 101 Freeway visits wind-carved caves in Gaviota State Park with great ocean views. Excellent description and photos! Thanks. Yay! Now there can be more graffiti and trash! 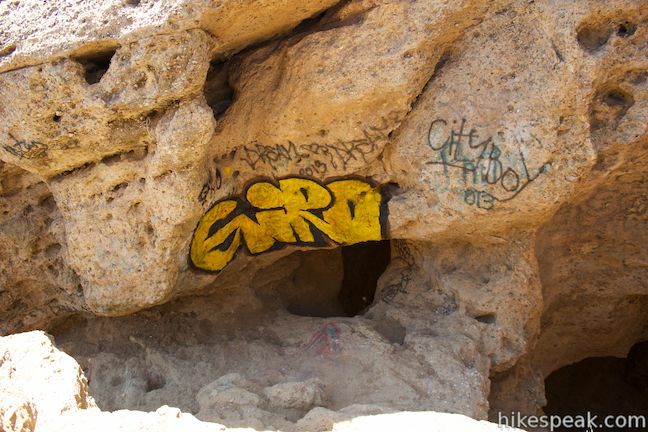 Most of the people that use this web site don’t leave trash or graffiti. Good point Tectonic! My son and his friends had fun there today. Helpful info and pics on this website. Is it possible to film at this location? My boyfriend and I had a blast here yesterday. Hardly any trash, and no graffiti. Wished it wasn’t as overcast and muggy as it as in 100 degree heat, but definitely coming back with friends. What a beautiful website…and so helpful. 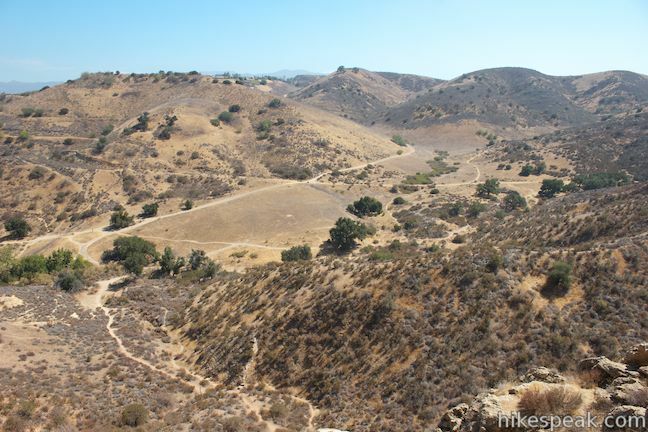 Would you be able to tell me if there is camping available at Upper Las Virgines Open Preserve? Thank you so much! 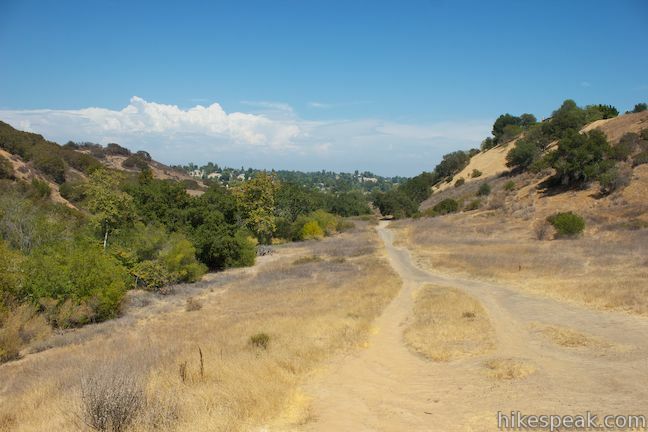 There’s no camping at Las Virgenes Canyon Open Space Preserve. 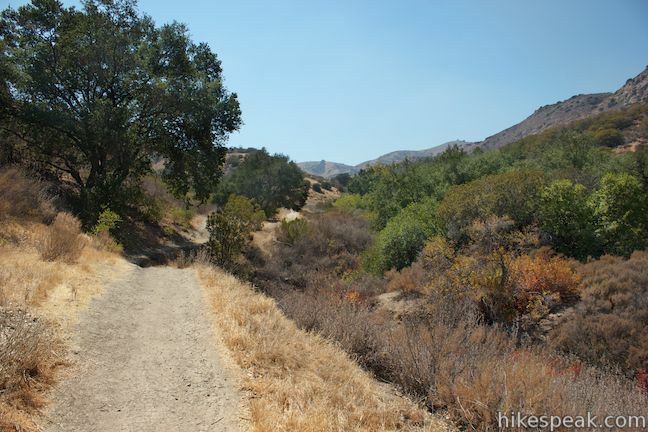 Malibu Creek State Park might be the closest place to camp. 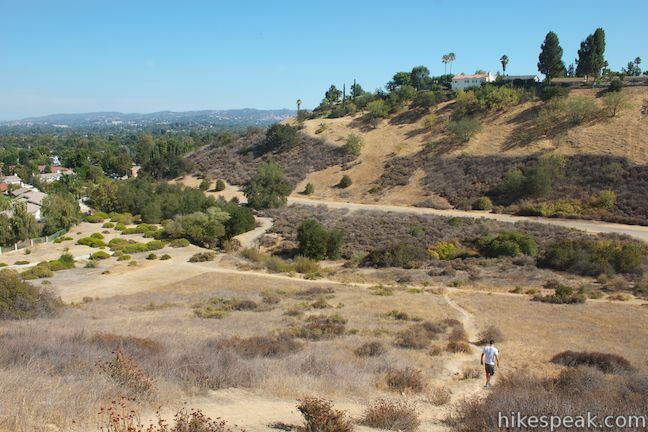 El Escorpion Park, at the end of Vanowen Street in West Hills, CA, is very popular with hikers, walkers and mountain bikers, and used as another entrance into the Santa Monica Recreation Area. 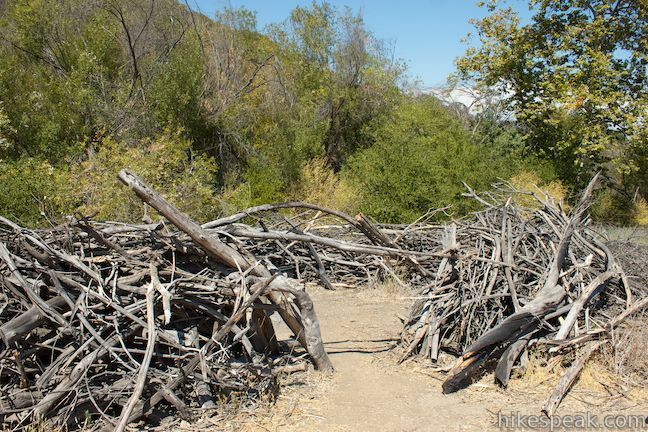 There are Indian burial sites in the area. 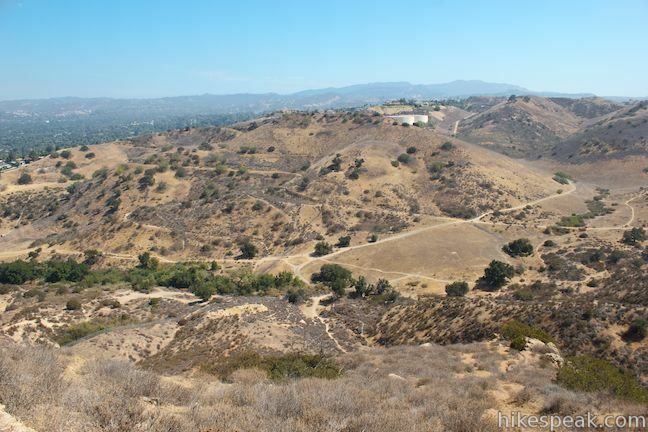 Developer Michael Naim, who is fronting Ben Resnick and others, is trying to obtain LA City Park Land, namely El Escorpion Park, in order to build a road through to his proposed development in these hills (a gate guarded private 53+ home development). Basically destroying the park, trails, etc. as it now exists. 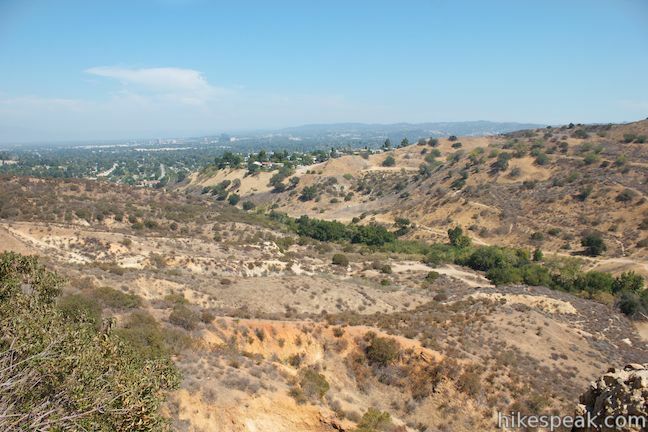 Contact Reeyan Raynes of the West Hills Neighborhood Council at reeyanv@ymail.com or (323)896-2326 for more information about this proposed development. What is the current status of this development? Thank you for such a thorough description of what to expect! 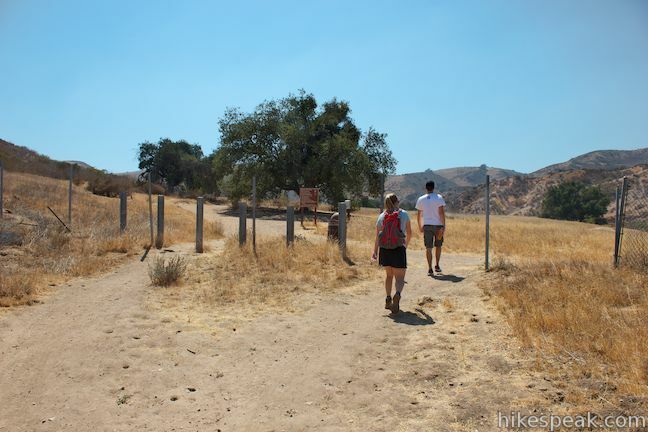 We walked the first portion and soon discovered that to the right (heading in), shade and some marshy spots kept us cool and more “inside” nature – among live oaks, sage, flowers, and some albeit graffiti’d trees on winding shaded paths. My buddy was too feeble to hike above the cave with me, so I took my drone! https://youtu.be/gQZLZXYYUv0?list=PL-LFi0fBjA1HeG94IJFw660HfsDrE6IA0 Adds a nice perspective I think. 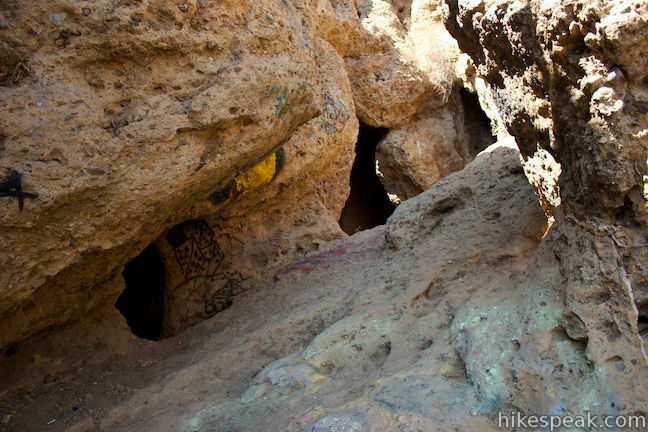 Also, watch out for that steep scramble above the cave to the top. That is some dicey business pulling yourself up those cables in the rock.